After my son, Brian died, I was grieving and had limiting beliefs. I didn't think I could go on. It was a difficult transition. And although I love and miss my son dearly, I had to press on. Eventually, I began writing again and following my passion, my dreams and setting new goals. 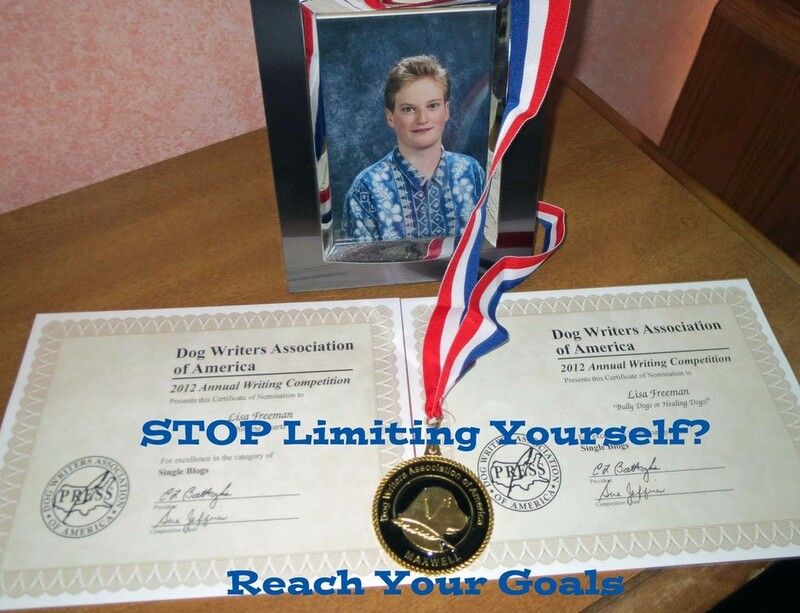 Soon after, I entered a contest with a story about my son and won these awards. We are taught all our lives that we are limited. There are boundaries and limits for nearly everything in life. Some are good and for our protection. But we can develop stifling limiting beliefs that start very young, even in childhood, that can hold us back reaching our goals. A limiting belief is something that becomes grafted into our being by what others have said or merely by our false beliefs. For instance, if you are told your entire life that you will never amount to much, you might start to believe that, so you settle for whatever life brings to you, instead of striving for something better. The first part of my life, I merely settled for whatever came my way. I suffered greatly for it. I wanted to be loved so badly that I settled for the first guy to come along, My first husband physically and emotionally abused me, my second husband sexually abused our three small innocent children. I'm learning that I have lived most of my life by huge limiting beliefs. Although I was the youngest child in the family and terribly spoiled, I grew up hearing, Money doesn't grow on trees," and "You have to work hard for what you get." I love my daddy and he was an excellent provider, but home wasn't always a comfortable place. He wanted us to be at home, but remain quiet. And our house had to be spotless, everything in place, or my dad wasn't happy. Aside from my mom going to work at a factory for eight hours, she had to come home and clean too.So what became grafted into my brain was that if you're a woman you have to work all the time, even at home, or you're not successful and keeping your man happy. This placed enormous stress on me throughout my life, always working, never taking a break, I pushed myself to exhaustion. Thankfully, I married John, who showed me balance. He would often break me away from my work and dance me around the living room, or pull me over to the couch to watch a movie, or make me a delicious romantic meal just for the two of us. At first I felt annoyed by his suggestions that I leave my work--because I was stressed thinking I had to get that done and I couldn't leave until I finished every bit of it. Another limiting belief I put on myself. The false beliefs and harsh expectations that we put on ourselves can actually limit our ability to excel. We can literally destroy any chance in life with relationships and a career,if we are stuck in limiting beliefs. I was told by my abusive husband that I was stupid and crazy. For a long time I believed him and battled severe crippling panic attacks and was afraid to do anything and go anywhere. But finally, I broke free of those false limiting beliefs that I had let others put on me. You can too. I recently was asked to be a motivational speaker for an insurance sales meeting. I wanted to empower them because they had a poor sales year in 2013. So, I shared our personal story of how we didn't have life insurance when Brian passed away. I also shared how each of them are valuable and important and not to limit themselves, not to focus on their inabilities, but rather their abilities. We are always told throughout life "the sky is the limit" but I told them that there is no limit to what any of use can do if we set our minds on goals, and stop listening to negative voices in our head. So, right now, I want you take a few moments to think. Do you have limiting beliefs? Are there things that others have said about you that aren't true and are holding you back from being successful? Now think about your greatest gifts and passion in life. What are they? Write them down. Write down some goals. Now, start taking steps toward reaching those goals.